One of the best tax-breaks in the UK is the Individual Savings Account (ISA). Each year every adult can invest up to £15.24k (rising with inflation) in one of these accounts. Any income or gains in these accounts is tax free, and doesn’t even need to be reported on the tax return. Awesome. £15.24k might sound like a lot of spare cash to find, but in reality what this means is selling £15k of existing assets and funnelling them as soon as possible (every April 6, at the start of the idiosyncratic UK tax year) into your ISA. Sure, you take the transaction fee hit, but you then get indefinite tax free income and gains. This is a no brainer. Allowances are use-it-or-lose-it and once you withdraw your funds (and – STOP PRESS from the last budget – don’t put them back again in the same tax year) those withdrawn funds lose their tax-free status for good. And while UK governments in the last 10 years have been inveterate tinkerers with savings and pensions, the regime for ISAs has only changed in a positive direction – to enlarge the annual allowance, and to improve the inheritance treatment. So ISAs feel like they are reasonably predictable over a decade or two. And £15k per year, for a decade or two, quickly amounts to some real money. I have always admired the FT journalist and Lord of the realm, John Lee, for becoming one of the UK’s first ISA millionaires. I aspire to equal his achievement, admittedly measured by a much weaker pound than when he reached this milestone some years ago. But they say the first million is the hardest, and compound arithmetic suggests that I can do far better than becoming an ISA millionaire. How much better? Currently the ISAs of Mr & Mrs FIRE are worth about double what we have invested in them (and would be worth more if I’d started earlier – I kick myself for not getting aggressive with my ISA allowance until a few years ago). We now max out every year’s allowance, moving over £30k this tax year into our ISAs. We tend to do this every April, to get the maximum benefit from the tax-free returns that ISAs provide. We’ve now reached a point that across our various ISAs that we have about £330k invested. Some way behind John Lee, but a useful nest egg nonetheless. 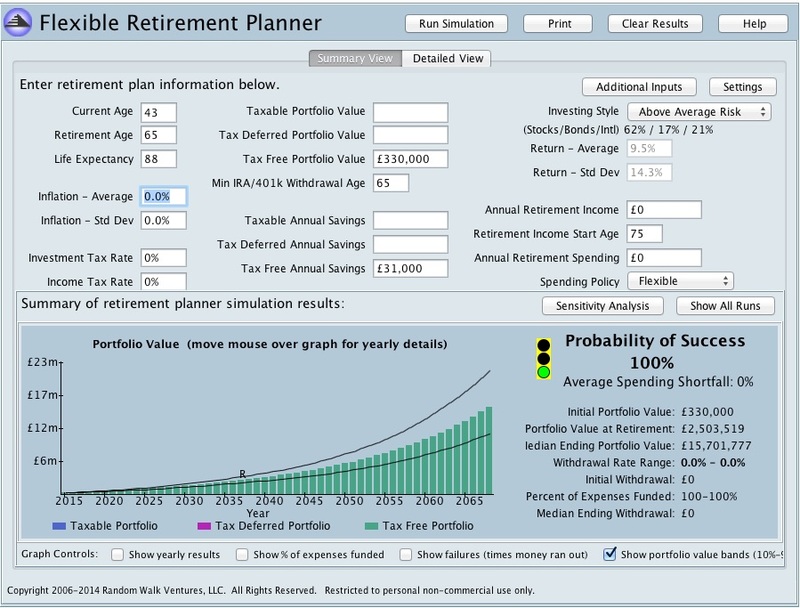 Using a retirement planner, what happens to our £330k? I have simplistically assumed that Mr & Mrs FIRE are one person, with a double-size ISA allowance, an average age of 43, and an average life expectancy of 88 (though this person has a one in four chance of reaching 96). I then assume we take ‘Above Average Risk’, which works out as 9.5% average annual return; this is lower than my last 3 years’ return but roughly in line with my 10+ year return. The retirement tool assumes, unreasonably conservatively, that my annual contributions don’t rise over time (whereas HM Govt has been indexing the annual limit recently). I also assume we never need to touch any of this money; we would spend taxable funds first. What our retirement calculator spat out: these funds grow to £28m ($43m) by our (joint) death in 2060. But in 10% of scenarios, they grow to at least £83.6m ($130m+). Holy shmokes. This doesn’t allow for inflation (currently negative in the UK) but as a headline number it’s still pretty impressive. Still OK to assume that the ISA tax break remains untouched until 2060 then, are we? Even assuming a more conservative 6% average annual return, which is probably more like what we can expect after inflation, our £330k still becomes £10m (in today’s money! ), with a 10% chance of exceeding £13.6m by 2060. If I/we do fulfil my/our 25% chance of becoming 96, then our ISA would be worth £15.7m (on average), and maybe (10% chance) £22.5m. As Monevator points out, the best investors are all dead. What if I/we don’t live until 88, let alone 96, but instead barely scrape through to 65? We still cruise past that ISA millionaire status. We’ll have, in almost all scenarios, at least £2.2m – and conceivably more than £5.7m. That’s assuming 8% return per year – which relies on a hefty equities allocation, but is less than I’ve averaged over a sustained period. If these numbers don’t get you salivating over investment returns, what would? Fascinating article. I agree, ISAs are perhaps the best financial product I have encountered. I had been assiduously saving into them for years and a couple of years ago started shifting much of my cash ISA over to a stock and shares ISA (a move I have been meaning to do for years). Last year was the first year–ever–I have managed to max it out. Hopefully the start of many! What is also highly attractive is that anything taken out of an ISA (at present) is free from tax as well (including “income”). Contrast this with a SIPP. Although, of course, you get the help from the taxman with a SIPP. That is a very impressive set of prospective forward returns from your ISA. Looking at the chart you provide, it is clear–as we all know–things really start to ramp up once you have really got some momentum behind it. I know its nice in theory but surely in reality you wont want to/ be able to get the 10M+? I don’t know about your aspirations but surely once youve reached your total to become fire you wont have to work to add any more to it. Of course im assuming your fire total is less than what a 10M portfolio would kick out. I have the same sort of question as Dom. What on earth would you do with all that money except count it :-)? @FVL – great post highlighting the numbers that can be acheived, it sounds pretty awesome! Very eye opening to see you have got 330K in your ISA accounts as well as how ever else much in taxable accounts – I would already count myself FI just from the ISA money… haha! @Firestarter: thanks! For anybody with taxable savings, £300k in an ISA as a couple is surprisingly doable. It has taken us much less than 10 years. But you are right that it doesn’t make me FI. I don’t watch tv I’m afraid but enjoyed that article. I knew a chap some years ago who retired to a boat in central America two years after graduating (two very successful years as a trader in the City! ); I have lost touch with him but last thing I heard that Torygraph article had it about right. I was wondering just the other day if anyone had reached the £1mil mark in ISA accounts, I suppose it was only a matter of time. Personally I love playing around with the calculators and like you; will hit the pension lifetime limit with maintained current contribution levels. Filling the ISA limit is still a pipedream for me as I prioritise the mortgage overpayments, partially for the guaranteed rate of return but primarily for the psychological achievement and safety. Still; If I had £330k in ISAs already.. I’d be drinking cocktails by the beach instead of contributing further to them!